Below, you'll find regulation high school basketball court dimensions along with measurements used for middle school and youth leagues. Looking for court sizes for other levels? Click here to find international, college, and NBA basketball court dimensions. When James Naismith first invented basketball, his 13 original rules didn't even mention court measurements. In fact, the game was played just about anywhere there was enough room to hold up to 80 players on the court at a time! His first rules allowed teams to have up to 40 players on the court. Can you imagine? Nowadays, the standard basketball court size is a rectangle 94 feet by 50 feet. However, measurements for high school, junior high, and youth league courts are somewhat smaller. 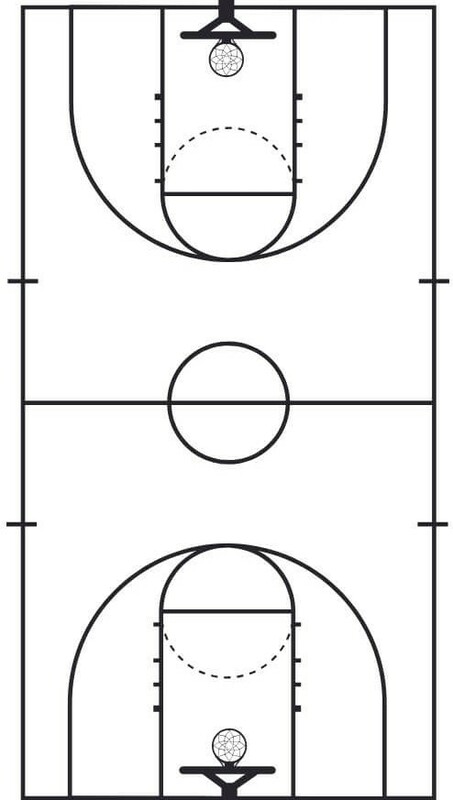 Need free printable basketball court diagrams﻿? 3-pt line 19' 9" 19' 9"
There's no official basketball court size mandated in youth basketball rules, but when possible they usually follow the guidelines for middle school/jr high. Often, for youth leagues and camps the size of the court depends on the facilities that are available. For the summer youth basketball camps I hosted at my church, we didn't have any courts. So, we turned our multipurpose facility into a makeshift gym with the help of a little court floor tape. The basketball court dimensions had to be modified to allow for a minimum of several feet on each sideline for safety and to make throw-ins manageable. For young kids and beginning players, I think a smaller court works really well because as the court size increases, fatigue becomes a factor in the game. For younger players, a smaller court allows the players to focus more on the game instead of wasting time and energy running up and down a huge court in transition. The height of the rim for youth basketball games can be as low as 8 feet for the youngest kids (usually under 8 years old) up to the standard height of 10 feet. In many youth basketball leagues, there isn't a 3-point line. I like this because as kids are first learning how to shoot, it's important that they take shots close to the basket so they can focus on using good shooting form. For upper elementary age, the standard high school 3-pt line is used. The free throw line for players ages 10 and up is usually the standard 15 feet. However, youth leagues often mark the floor about 2 feet closer to the basket for the younger players to use. Most of us don't have the luxury of a gym when we want to shoot around. If you're lucky, you might have access to a local outdoor court with real court markings, but more than likely you'll just head out to your driveway. When I was a kid our basketball court was on a winding driveway that sloped downhill. Every shot I took was a unique experience, and I remember chasing many balls down that hill! How I envied the neighbors down the street who had their very own backyard basketball court. Few backyards are big enough to fit an 84' x 50' full-size court. Sometimes, families have enough room for a half-court. But, most make due with the size of their driveway. I get commissions for purchases made through links in this post. As an Amazon Associate I earn from qualifying purchases. 19 top basketball drills to improve shooting technique. Learn how to shoot a basketball with better form and accuracy with these shooting drills for kids. 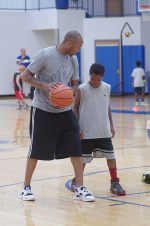 16 control dribbling drills that will improve ball handling skills in youth basketball players. Basketball ball handling drills for players of all ages. Improve your basketball game by starting each workout with this stationary dribbling routine. By Claudia Schleyer, Copyright @ 2007-2019 YouthHoops101.com. All rights reserved. No reproduction permitted without permission.